FOR THOSE WHO HAVE ANDROID TV BOX: GOOD NEWS TO THOSE WHO LIKE TO WATCH LIVE INDIAN CHANNELS, WE HAVE RECENTLY ADDED INDIAN CHANNELS INTO OUR SKY-V MALAYSIA PACKAGE. CHANNELS THAT YOU HAVE BEEN LONG WAITING FOR . . . Watching TV Programme from internet is the most cost saving way. As long as your home internet is more than 4Mbps without download limit, you are able to enjoy movie, drama and live channel from worldwide. Purchase our BD-T2 TV box, we will pre-setup your box to movie database, pay live channel service & free live channel service. 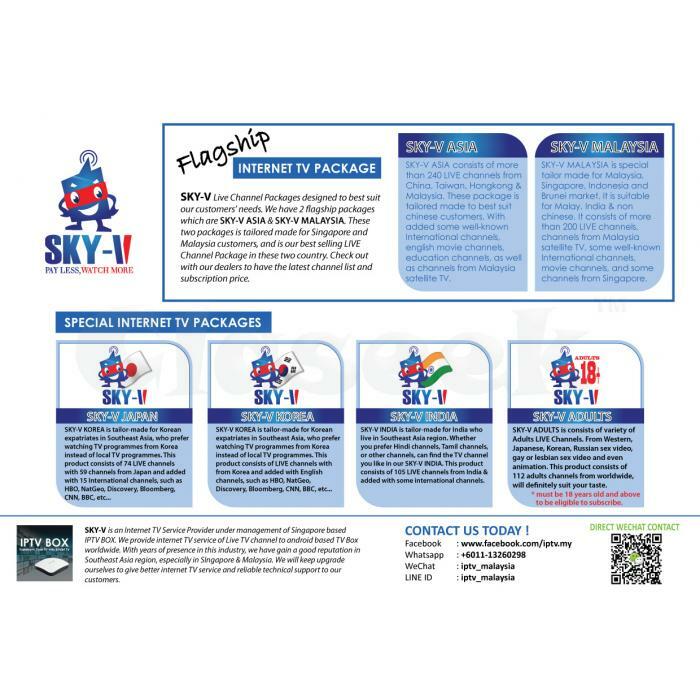 SKY-V MALAYSIA is special tailor made for Malaysia, Singapore, Indonesia and Brunei market. It is suitable for Malay, India & non chinese. It consists of more than 200 LIVE channels, channels from Malaysia, some well-known International channels, movie & entertainment channels, and some channels from Singapore, Thailand, as well as from Vietnam. SKY-V is an Internet TV Service Provider under management of Singapore based IPTV BOX. We provide internet TV service of Live TV channel to android based TV Box worldwide. With years of presence in this industry, we have gain a good reputation in Southeast Asia region, especially in SIngapore & Malaysia. We will keep upgrade ourselves to give better internet TV service and reliable technical support to our customers.